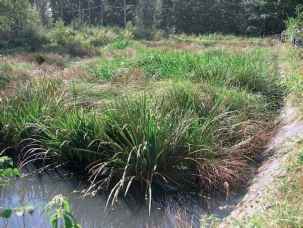 Glyceria mnaxima (giant sweetgrass, mannagrass), Phragmites australis (common reed), Cyperus papyrus (papyrus), Alternanthera philoxeroides (alligator weed), or Hydrocotyle umbellata (pennywort) are all capable of growing in mats. Treatment systems have been operated in this fashion; however, in some cases the floating mats developed unintentionally. CW with floating mats of G. maxima was used to treat meat processing effluent rich in nitrogen in New Zealand in the late 1980s. Sections of mat of G. maxima were excised from a mature wetland and floated on the wastewater to rapidly establish a plant cover on the wetland. No soil or sediment was placed at the bottom of the system. Results of this study indicated that in the summer the removal of total nitrogen increased when it reaches 53%. The active denitrification sites in the floating wetland system were the plant mat and the sediments (which developed during the operation of the system), both of which supply organic carbon and anaerobic sites for denitrification. Figure 13 CWs with floating emergent vegetation for combined sewer overflow at Branst-Bornem, Belgium. Photo by J. Vymazal. both plants is so vigorous that there is no need to keep the plants in upright position. The advantage ofthese systems is that both above and belowground biomasses could be harvested and the amount of nutrient removed via har vesting is much higher as compared to other CWs which use emergent vegetation.